Reward – Accident Information McKinney, TX. Not Fishing related, but this involves some friends of ours and any information would be greatly appreciated. On November 1, 2008 someone had taken a railroad tie and laid it perpendicular across the service road in the left lane just before the entrance ramp. A group of motorcyclists were heading up the sevice road to get on to northbound 75 and could not see the railroad tie. One rider died at the scene and 3 others had to be taken to Parkland. 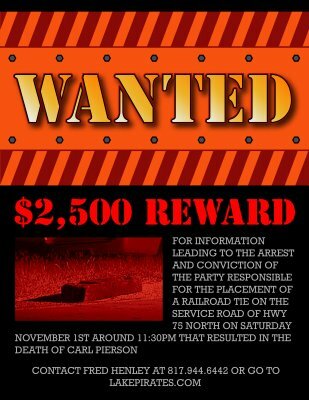 A Reward has been set up for anyone who has information leading to the arrest and conviction of those who placed the railroad tie where it could not be seen. For more infomation contact Fred Henley at 817-944-6442 or visit LakePirates.